Goldenhar syndrome consists of a varied group of malformations that can involve multiple systems of the body. It is believed to be a variant of hemifacial microsomia with ocular and vertebral involvement. Characteristic findings, such as hypoplasia of one half of the face, epibulbar dermoids, ear tags, and spinal cord defects, warrant the name occulo-auriculo-vertebral dysplasia. The syndrome occurs due to imbalance in cells during the blastogenesis period of embryo formation. It is found to involve the derivatives of first and second branchial arches. The condition is apparent at birth, but the phenotype can vary greatly in its severity depending on the activation and expression of the defective gene. Reported here are detailed clinical and radiographic features of two sporadic cases of Goldenhar syndrome in young males. This work mainly highlights the various theories of etiopathogenesis as well as step-wise management protocol for patients diagnosed with the syndrome. The syndrome is known by several names, including facio-auriculo-vertebral dysplasia, unilateral craniofacial microsomia, first and second branchial arch syndrome, lateral facial dysplasia, otomandibular dysostosis, velocardiofacial syndrome, and unilateral mandibulofacial dysostosis., The varied names are probably a result of its uncertain etiology. A number of hypotheses have been proposed to explain the etiopathogenesis. The first was put forward by Gorlin and Pindborg in 1964 who suggested that an unknown primary cause of faulty embryological development causes abnormality of the mesoblasts giving rise to branchial and vertebral anomalies. Jong Bloet hypothesized that the syndrome was a result of fertilization of overripe or aged ovum., A multifactorial etiology has been proposed where nutritional and environmental factors along with genetic dysregulation have been projected as the causative factors. Abnormality of blastogenesis and imbalance in the superior aspect of neural crest cells, ingestion of drugs such as thalidomide, cocaine, retinoic acid, tamoxifen, and primidone by the expectant mother, maternal diabetes or malnutrition, exposure to tobacco or herbicides during pregnancy, chromosomal aberrations such as 3del(5p), del(6q), del(8q)(161), del(18q), del(22q), recombinant chromosome 18, ring 21 chromosome, and dup(22q) have been cited as the other causes of Goldenhar syndrome.,, Maternal and fetal hypoxia, hypertension, and the use of anticoagulants can result in hematoma in the region of the developing ear and jaw which causes destruction of the differentiating tissue leading to branchial arch dysplasia. It has also been seen that radiodiagnostic procedures such as cholecystography practiced between the 4th and 6th week of gestation may cause the appearance of Goldenhar syndrome. It may occur sporadically due to changes early during embryogeneses such as decreased penetrance, somatic mosaicism, and epigenetic changes, or it may occur as a result of chromosomal aberrations following consanguineous marriage where an increase in severity is seen in cases of paternal inheritance. A 3-year-old male patient reported with a complaint of decay in the upper front teeth for 1 year. Medical history revealed that the patient had undergone surgery to correct microsomia at 1 year of age. On genealogic investigation, it was revealed that the patient was the third child born to young, healthy parents with no history of consanguinity. However, the origin of ancestors was from the same endogamic territory. The child was born at full term and the antenatal and family histories were noncontributory. General physical examination revealed that the patient was well nourished with normal developmental status and milestones. 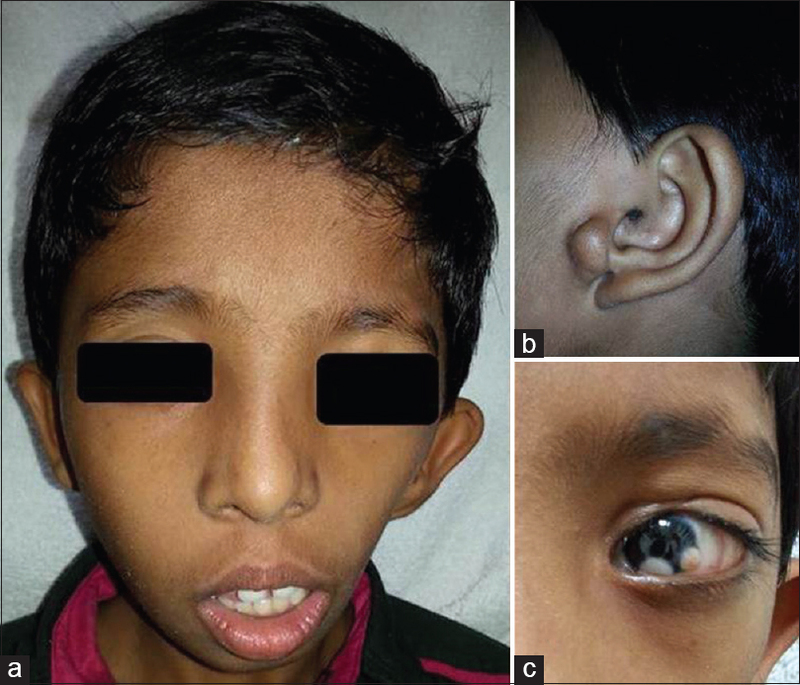 On head and neck examination, facial asymmetry with right-sided mandibular and malar hypoplasia, microtia of the right ear with preauricular tag and epibulbar dermoids in the right eye were seen [Figure 1]. On intraoral examination, a surgical scar was seen at the right lip commissure. Deflection of the mandible toward the right, posterior cross bite, and decay of the upper and lower anterior teeth was seen. Radiographic investigations were carried out. Panoramic radiograph showed rudimentary condyle and coronoid process and reduced ramus height on the right side when compared to the left. Developing tooth buds were observed in all four quadrants [Figure 2]. Based on the clinical and radiographic features, the patient was diagnosed with Goldenhar syndrome. Restoration of the decayed teeth was carried out and the parents were educated on the necessity of a multidisciplinary approach to treatment. Extirpation of the preauricular tags and correction of the auricular and ophthalmic defects were planned for a later date. Distraction osteogenesis was started to aid in mandibular growth [Figure 2]. A 10-year-old male patient reported with a complaint of defect in the mouth since birth. The patient was the only child of a nonconsanguineous marriage with no relevant antenatal or family history. General physical examination revealed that the patient was well nourished with normal developmental status. The patient was noticed to be an obligate mouth breather. On head and neck examination, upper eyelid coloboma, epibulbar dermoids, and symblepharon in the left eye, left mandibular hypoplasia, and preauricular tag on the left side were seen [Figure 3]. On intraoral examination, deviation of the mandible toward the left side, narrow high-arched palate, decayed upper and lower left first molars and right lower first molars, grossly decayed deciduous second molar on the left side was seen. On radiographic examination, panoramic radiograph showed hypoplasia of the condyle and coronoid process and reduced ramal height on the left side. Developing tooth buds were observed in all four quadrants. Posteroanterior cephalogram showed decreased height of the ramus on the left side with shift in midline toward the left. Deviated nasal septum and hypoplastic maxilla were also present. Lateral cephalogram showed a steep mandibular plane with clockwise rotation indicating vertical growth pattern [Figure 4]. Based on these features, the patient was diagnosed with Goldenhar syndrome. A series of surgical treatments including bone grafting, osteotomy followed by maxillary advancement and orthodontic intervention, rhinoplasty, and ophthalmologic and esthetic corrections were planned. Goldenhar syndrome is a developmental disorder characterized by varying severity of craniofacial abnormalities including oral, vertebral, renal, and cardiac anomalies [Table 1].,,, Its prevalence ranges from one in 3500 to one in 7000 live births with a male to female ratio of 3:2. Although considerable research has been undertaken on the genetic basis of human diseases, it largely remains uncertain in cases of such syndromes. Since features of Goldenhar syndrome primarily involve structures of the first and second branchial arches, it has been suggested that derangement in the embryonic development of these arches may be the etiology of this syndrome. The severity and disparity of the phenotype depends on the expression as well as activation of various genes and proteins which are responsible for the migration, specification, proliferation, and survival of neural crest cells. Since Goldenhar syndrome is thought to be a manifestation of reduction in blood flow and local hemorrhage in the first and second branchial arches during the blastogenesis period in 30–45 days of intrauterine life or due to defective mesoderm formation or defective interaction between mesoderm and neural crest cells, prenatal ultrasonic diagnosis may theoretically be done at the 11th–15th week in utero., However, it has been seen that only cases with severe malformations have been detected using regular ultrasound. Newer imaging modalities such as three-dimensional ultrasound may help in detection of microtia, preauricular tags, and asymmetry of the mandible even in mild forms. Most cases of Goldenhar syndrome occur de novo, but an autosomal dominant or recessive inheritance has also been noted. An empiric sibling recurrence of 2%–3% is reported. During recurrence risk counseling in such cases, a three-generation family history has to be determined looking for cases as mild as ear tags or ear pits. Although there is not yet a specific genetic test to detect Goldenhar syndrome, array comparative genomic hybridization should be considered while testing for a possibility of recurrence. Goldenhar syndrome has a complex group of phenotypic variations ranging from simple ear tags to cardiac and vertebral anomalies. Although a number of theories have been put forth regarding its etiology, understanding the molecular basis of these malformations will help in ascertaining the pathogenesis of this syndrome. A long-term treatment protocol with multidisciplinary approach starting with patient and parent education and recurrence risk counseling should be instituted for optimal patient management. Gorlin RJ, Cohen MM, Hennekam RC. Syndromes of the Head and Neck. 4th ed. New York: Oxford University Press; 2001. Sinha S, Singh AK, Mehra A, Singh R. Goldenhar syndrome – A literature review. JSM Dent 2015;3:1052-5. Kokavec R. Goldenhar syndrome with various clinical manifestations. Cleft Palate Craniofac J 2006;43:628-34. Neto FX, Silva DL, Franco KM, Nascimento LF, Neville T, Vaconcelos VF. Goldenhar syndrome – A warning for the otorhinolaryngologist. Int Arch Otorhinolaryngol 2007;11:196-201. Johnson KA, Fairhurst J, Clarke NM. Oculoauriculovertebral spectrum: New manifestations. Pediatr Radiol 1995;25:446-8. Caccamese JF Jr., Costello BJ, Mooney MP. Novel deformity of the mandible in oculo-auriculo-vertebral spectrum: Case report and literature review. J Oral Maxillofac Surg 2006;64:1278-82. Tasse C, Majewski F, Böhringer S, Fischer S, Lüdecke HJ, Gillessen-Kaesbach G, et al. Afamily with autosomal dominant oculo-auriculo-vertebral spectrum. Clin Dysmorphol 2007;16:1-7. 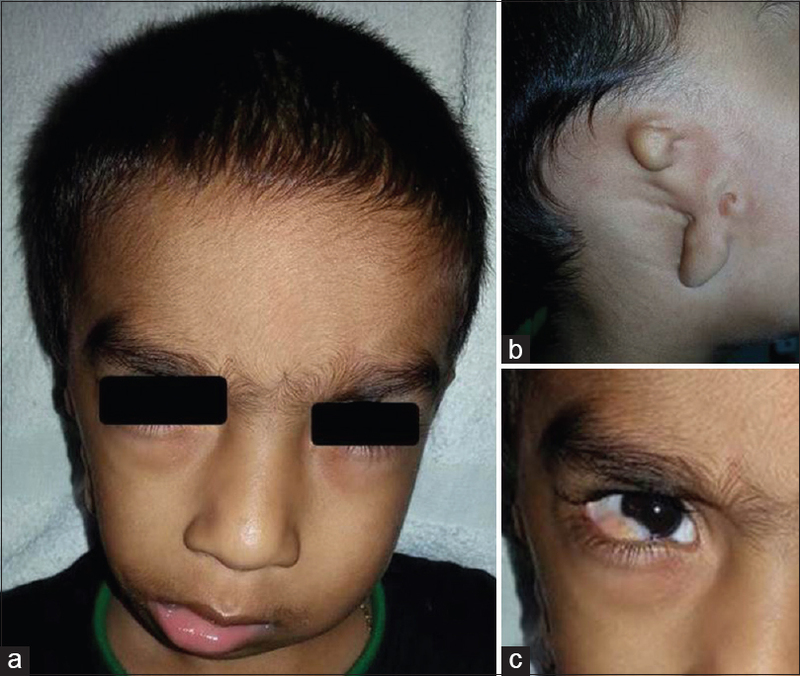 Sharma JK, Pippal SK, Raghuvanshi SK, Shitij A. Goldenhar-gorlin's syndrome: A case report. Indian J Otolaryngol Head Neck Surg 2006;58:97-101. Beleza-Meireles A, Clayton-Smith J, Saraiva JM, Tassabehji M. Oculo-auriculo-vertebral spectrum: A review of the literature and genetic update. J Med Genet 2014;51:635-45. Martelli H Jr., Miranda RT, Fernandes CM, Bonan PR, Paranaíba LM, Graner E, et al. Goldenhar syndrome: Clinical features with orofacial emphasis. J Appl Oral Sci 2010;18:646-9. Gordon CT, Petit F, Oufadem M, Decaestecker C, Jourdain AS, Andrieux J, et al. EFTUD2 haploinsufficiency leads to syndromic oesophageal atresia. J Med Genet 2012;49:737-46. Voigt C, Mégarbané A, Neveling K, Czeschik JC, Albrecht B, Callewaert B, et al. Oto-facial syndrome and esophageal atresia, intellectual disability and zygomatic anomalies – Expanding the phenotypes associated with EFTUD2 mutations. Orphanet J Rare Dis 2013;8:110. 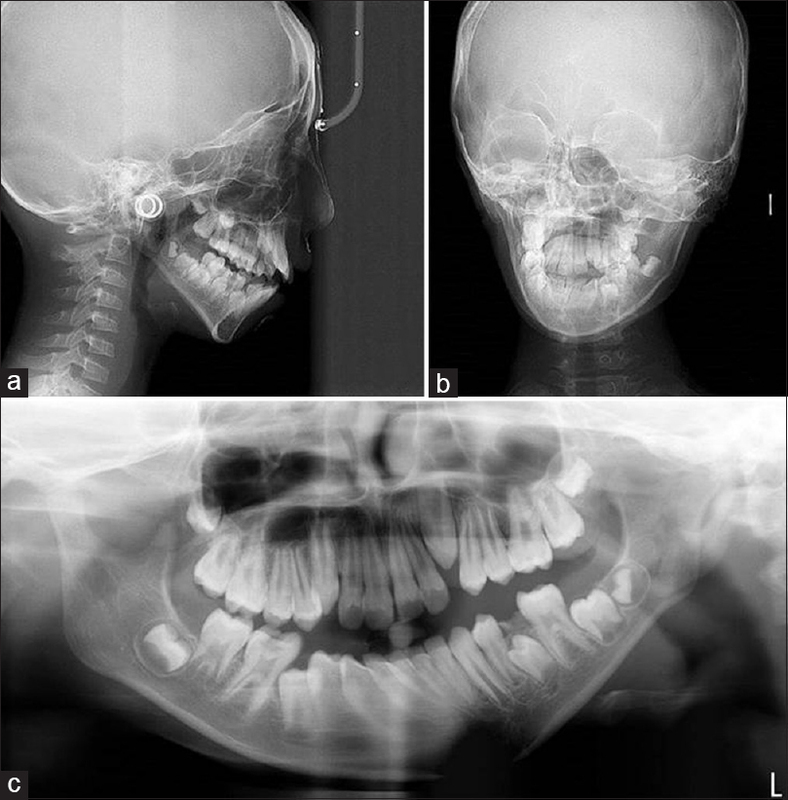 Kumaresan R, Srinivasan B, Narayanan M, Cugati N, Karthikeyan P. Craniofacial abnormalities in goldenhar syndrome: A case report with review of the literature. Plast Aesthet Res 2014;1:108-13.